Sister was home from Vietnam for a couple of days before she returns to Shanghai again in the middle of this week. We had dinner together yesterday evening after we sorted out some matters at Standard Chartered Bank. I had planned on bringing her to try BELLUNO Cafe in Kiarong but she told me that she was craving for sashimi. 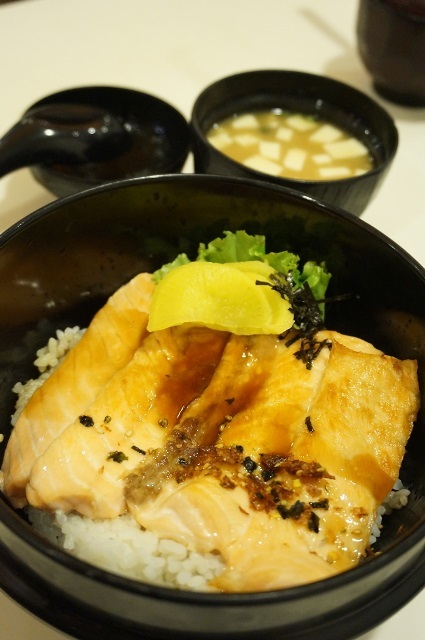 When it comes to sashimi, I would normally choose Kaizen Sushi Waterfront over any branches of Excapade Sushi. But Sister did not want to go far and did not even mind Excapade Shokudo. Of all the Excapade Sushi branches, I would avoid Excapade Shokudo as I find their service and food quality to be inconsistent. So, we ended up at Excapade Sushi, Regent Square as I intended to do some grocery shopping at Hua Ho, Kiulap after dinner. I wanted to buy a tray of eggs for baking but they were completely sold out. The only ones left were those in a pack of 10. So, I left with only a bottle of cream of tartar and cranberry juice for my Cranberry Bread Loaf. Without further ado, let me show you what we had for dinner yesterday evening. 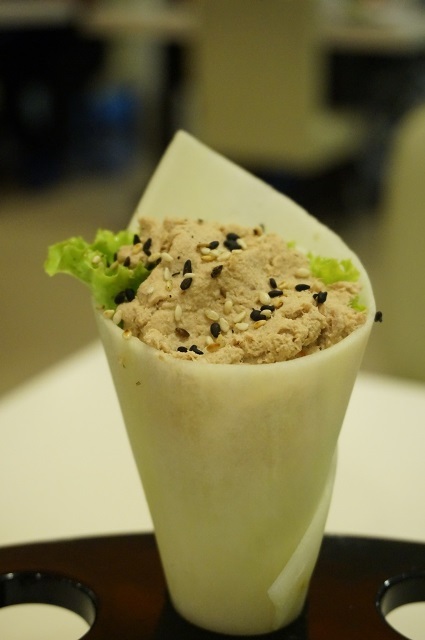 Sister ordered this as she was craving for tuna. She did mentioned that the cucumber skin was a little bit too thick compared to what she had normally. But I think it is not easy to slice thinly provided that you have the right tool for it? Ordered this to share with Sister since I had light dinner meal before meeting her at Manggis Mall. Portion was a little bit too small for two but definitely more than enough for one. Rice was nice but we thought the salmon fillets were overcooked. They were dry instead of juicy. Miso soup was complimentary with the dish but it was way too salty. I personally find all the miso soup served at Excapade Sushi tend to be extremely salty for normal taste buds. A must have dish at Excapade Sushi. 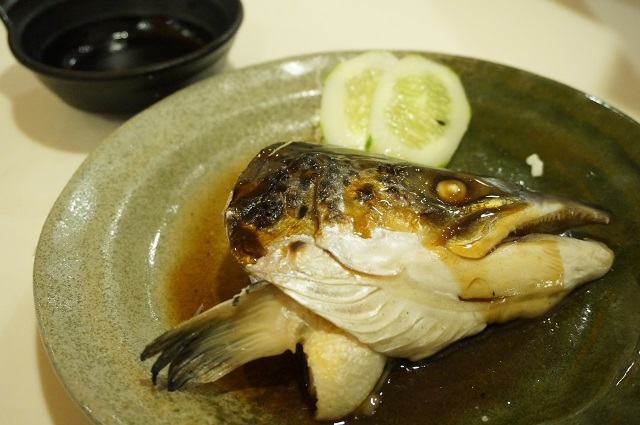 Grilled Salmon Head comes in three sizes – small, medium and large. But we were being told that they only had small size left yesterday evening. So, we made do with the small size. Extra sauce was given as well but the sauce on the fish itself was more than enough. This took forever to arrive. It was not even ready when we had finished all the food served to us. Planned on cancelling this order but was told that they were done making them. Thankfully, these Tako Yaki were worth the wait. 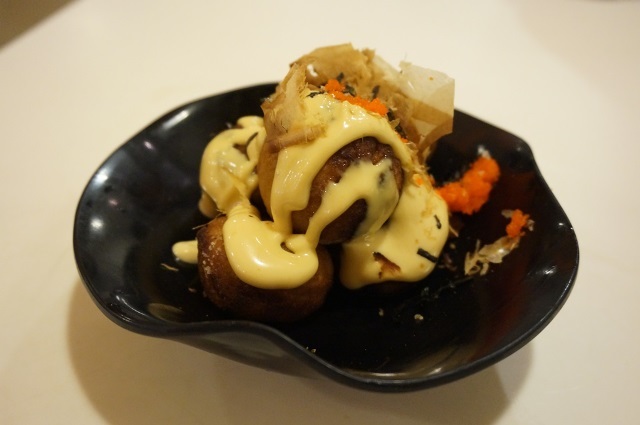 It was not as floury as some other Tako Yaki which I had tried before. It was slightly crunchy but squid portion was minimal. Sorry for the lack of update over the past few days as there hadn’t been much happenings in my life lately. All I did was work, eat and sleep. LOL! 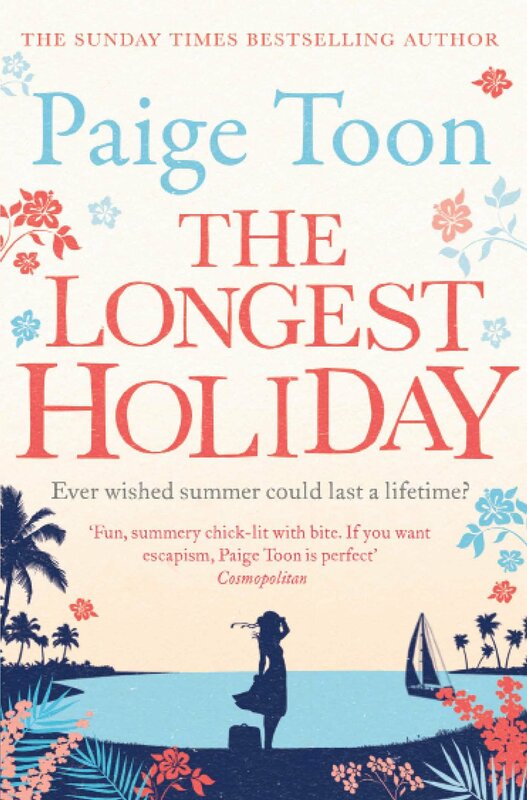 I did not even hang out with friends after work as work had been a wee bit hectic for the past week and I would prefer heading home straight after work rather than loitering in shopping malls or cafes. 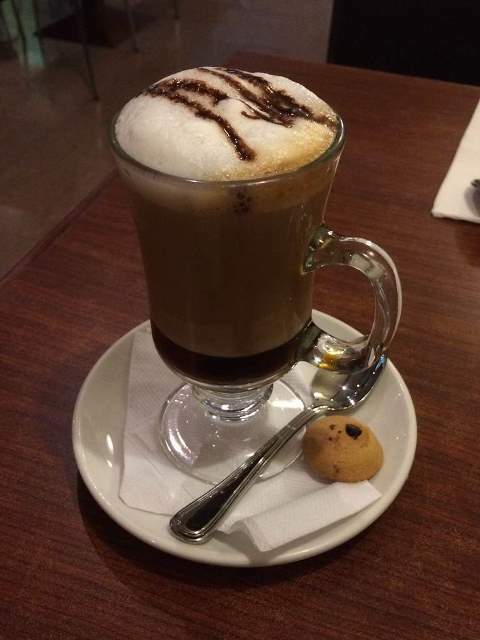 Sister will be home from Vietnam next Tuesday and I am thinking of bringing her to try either BELLUNO Cafe or Danes Cafe. I had been to the latter twice but only once to the former. Perhaps I should bring her to BELLUNO Cafe? I would prefer Piccolo Cafe but they are only open until 6:00PM in the afternoon on weekdays. I think I will only bring her to Piccolo Cafe when she comes back from Bali next March. Anyways, dinner tonight was at Piccolo Fratini as I don’t feel like having company’s provided dinner. I was hoping that there wouldn’t be much patrons as I did not have a lengthy meal time. I was thinking of a 30 minutes dinner time before heading back to work. Guess what? The restaurant was completely deserted at the time when I arrived but slowly filled with more patrons as I was tucking into my dinner. Bear with me with the lousy resolution of my pictures as I did not bring my SONY NEX-3N with me. So, I made do with my iPhone 5S. A lot of my friends preferred their Samsung or iPhone camera over a real camera when taking pictures. To be honest, I prefer a real camera more than a mobile phone camera. I find pictures taken by iPhone 5S rather grainy for my liking. I had wanted Caramel Latte but was being told they don’t serve Caramel Latte but Cafe Latte only. But they recommended me their Moccalypso which came with a super thick layer of caramel syrup and topped with chocolate syrup on the foam. This is definitely not something which I would want to order again. Caramel layer was too generous to the extent that it overpowered the taste of coffee. I felt like having Carbonara so I had this. 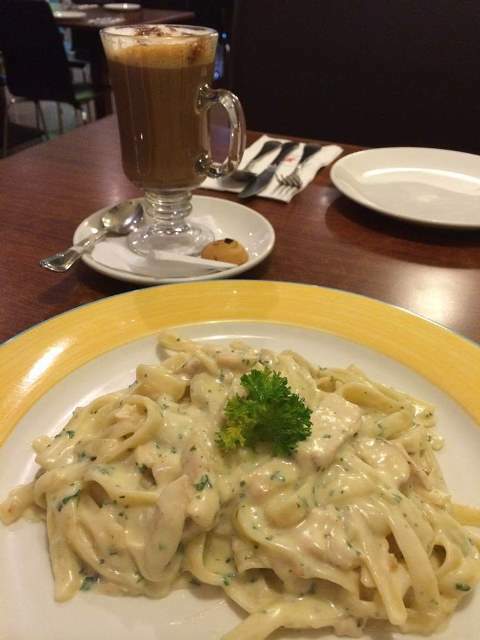 Unfortunately, this is the only Carbonara pasta that Piccolo Fratini’s serves. All in all, this is quite okay. It wasn’t being overly flavorful but tasted just fine. Instead of bread/buns baking, I decided to attempt steamed buns. Mom had been complaining that she kept on getting ulcers after trying my baked products. If you had been following my blog, you would have known that I had been attempting quite a few bread/buns recipes. And Mom would usually wait for at least overnight before she tries on my baked products. Reason being, she wanted to reduce the chances of getting mouth ulcers. Anyways, I had attempted steamed buns with the bread machine couple of months ago. Unfortunately, it was not successful as the buns looked hideous while they were still steaming. And sadly, they turned dense and hard when they had cooled down. 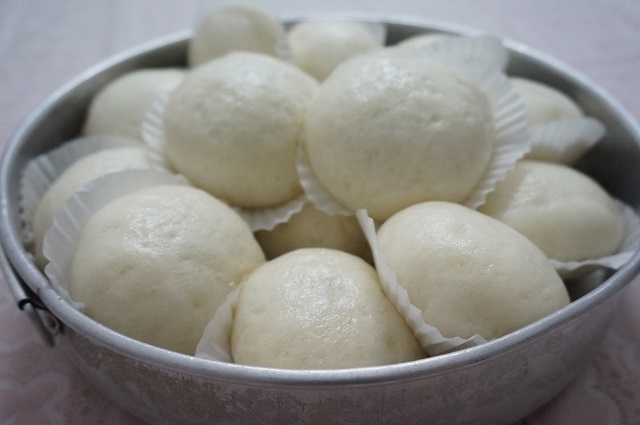 So, I decided to try the simplest recipe which I could find of Steamed Red Bean Buns which was also literally known as Tau Sar Pau in Chinese. One of my colleagues had bought the premix kind of Pau Flour couple of weeks ago and the texture was good and soft. But I decided to make these buns from scratch since I still have a bag of unused Hong Kong Special Flour but with the use of a bread machine. Without further ado, let me show you my version of Steamed Red Bean Buns! 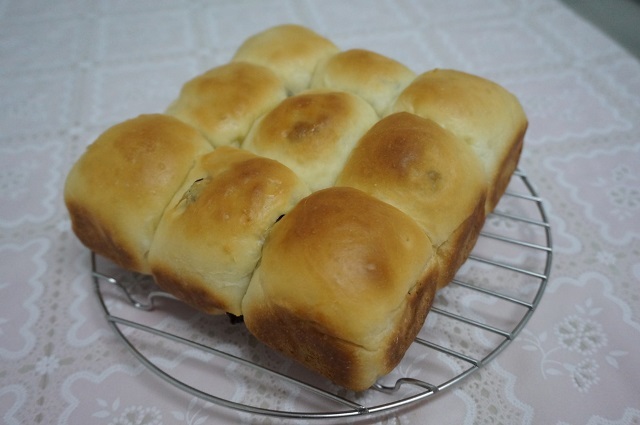 There are a lot of recipes which you could find from Google for Steamed Red Bean Buns but I chose this recipe as it was the easiest which I found. GUAI SHU SHU also has a recipe for Steamed Red Bean Buns but my bread machine could not hold that much amount of flour at the same time. Measure and weigh all ingredients in advance. Remove bread pan from the bread machine and install collapsible paddle. Place and pile up all ingredients in the same order as above (water, oil, flour, baking powder, sugar and instant dry yeast). Wipe spillage outside the bread pan, if any. Return the bread pan into the bread machine and close the lid. Choose setting (Dough) and press START. Wait for machine to finish all cycles before removing the bread pan from the bread machine. 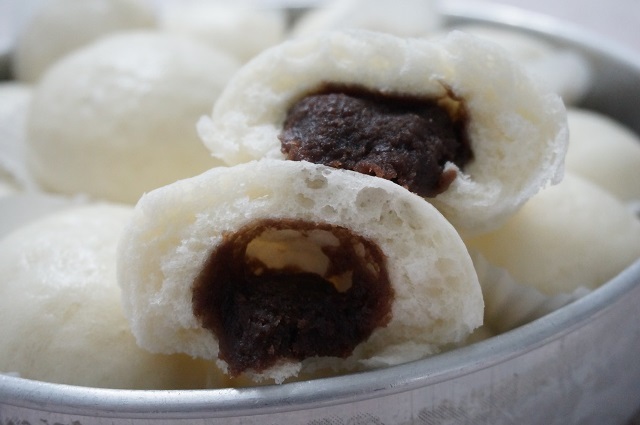 While waiting for the dough to be ready, shape the red bean paste into balls with the weigh of 20 grams each. Set aside until they are to be used. When the dough is ready, sprinkle some flour on top of the proofed dough. Sprinkle some flour onto worktop and remove the dough from the bread pan onto the floured worktop. Press down the dough to release the air trapped inside. Divide the dough equally into 16 portions. Flatten up each individual dough and wrap red bean paste filling in it. Close the dough, pinch to seal and shape the dough into balls. Let the dough do the final proofing in a closed oven (without power switched on) for about 20 to 30 minutes or when the dough doubled in size. When the dough are ready, steam them over high medium heat for about 12 minutes. I was extremely pleased at how these buns turned out to be. But of course, credits would go to Mom as she was the one who did all the shaping, filling and steaming. All I did was measuring the ingredients and dump them into the bread machine for kneading. The buns stayed soft even they were exposed under the fan for quite some time. I like how soft they were when I pressed them down with my finger. Texture wise, they were perfect but filling was rather too much for such small size buns. I would suggest 10g of red bean paste for each dough next time. 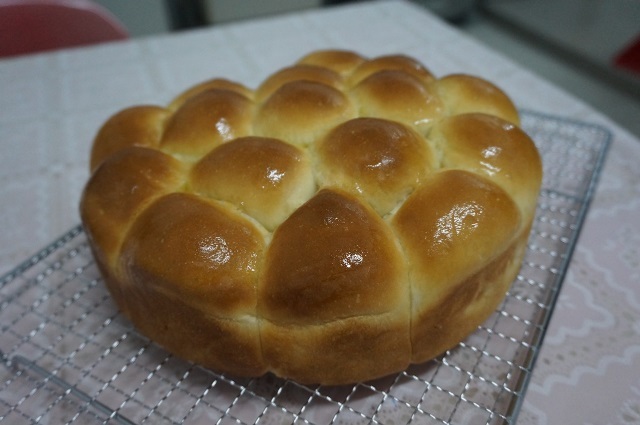 I will probably attempt these buns again over the weekend so that Sister can bring them back to China next week. These buns can last for quite some time as long as they were properly stored inside the freezer. Bring them out to thaw when you feel like eating them. Steam them over a rice cooker and they will still taste fresh like they were just freshly made. As I brought more than half of my Old Fashion Pull Apart Butter Rolls to workplace for my colleagues this morning, I did not have much left at home for my parents. 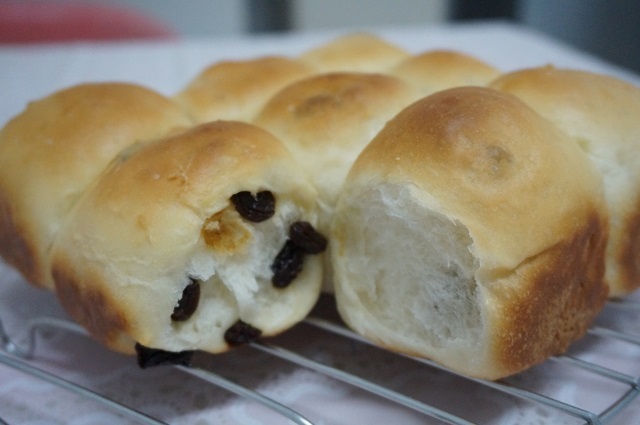 Hence, I baked Sweet Milk Raisin Buns after dinner. I attempted this recipe few evenings ago but they did not turn out well enough. Texture wise, the buns were soft and fluffy but they looked hideous! Rather than dividing the dough equally with a dough cutter, I decided to tear them apart and weigh them on a scale. That way I will get equal dough. At least their shapes and weigh would not go out of proportion. And I got almost equally shaped Sweet Milk Raisin Buns when they were baked. If you are wondering if I created this recipe on my own, I did not. 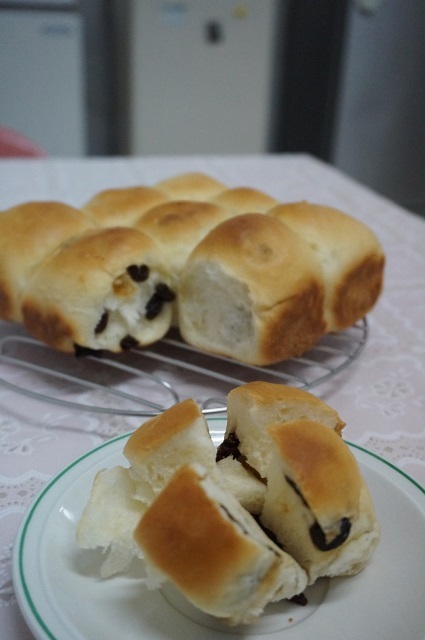 I adapted the recipe of Sweet Milk Buns from My Mind Patch and added raisin while shaping the individual dough. Place and pile up all ingredients in the same order as above (milk, sweetened condensed milk, egg, butter, flour, milk powder, salt, sugar and yeast). Sprinkle some bread flour on top of the proofed dough. Leave it to rest for 10 minutes. Divide the dough equally into 9 portions and each weighs approximately 50 grams or so. Flatten up each individual dough with a rolling pan and sprinkle desired amount of raisin on top and roll them up. Shape the dough into balls. Place the ball shaped dough into a greased and lined 18cmx18cm baking pan. Let the dough do the final proofing in a closed oven (without power switched on) for about 40 minutes or when the dough doubled in size. Remove the dough from the oven and preheat the oven to 180 degree Celsius for 10 minutes. Bake the proofed dough for approximately 20 to 25 minutes or until the top were browned. Remove baking pan from oven when baked and transfer the buns onto cooling rack to cool immediately. Glaze the buns with melted butter while they are still hot. I was pleased that my buns rose quite evenly this time round. I had added in too much raisin in some of the dough and I am sure that Dad will complain that these buns being overly sweet. Texture wise, they were soft and fluffy. But these buns turned a little bit hard on the top and sides this morning. I should have stored them inside a zip lock back right after they had cooled down yesterday evening. But all in all, these buns are nice for both breakfast and tea time along with a cup of hot coffee. I did not do much today apart from buns baking. I went out this morning for breakfast with Kaylie and Si Yieng at Phong Mun Restaurant. I went stationary and grocery shopping after breakfast. Did not buy much but two packets of bread flour. I had been buying bread flour more than cake flour lately. Speaking of which, I still have two tubs of natural plain yogurt which I have yet use and they are about to expire soon. I guess I need to bake muffins with them soon before they go into the bin. Anyways, I am waiting for my second dough to be ready as I am writing this. I am reattempting Sweet Milk Raisins Buns again after the unsuccessful attempt few nights ago. It bloomed alright but they were out of shape. They looked hideous. So, the “kiasu” me would never live to myself being unsuccessful with that recipe. But anyways, I will be sharing with you a recipe which I found from GUAI SHU SHU‘s blog last week. It was a straightforward recipe without complicated ingredient which you can’t find in your kitchen. Instead of using bread flour, this recipe called for plain flour. And therefore, it intrigued me to try out this recipe. I was curious to know how would the texture of the buns be with plain flour instead of bread flour. Without further ado, let me show you my final product! Note: I am using a bread machine for dough kneading rather than hand knead or using a stand mixer. So, my direction guidelines will be based on how I make them with my bread machine. If you are using a mixer, please go to the original recipe with the link above for detailed descriptions and illustrations. Measure and weigh all the ingredients in advance. Place and pile up all ingredients in the same order as above (milk, butter, plain flour, corn flour, milk powder, sugar, salt, and yeast). Do make sure that the salt do not directly touch the yeast. Press down the dough to release the air trapped inside and leave it to rest for 10 minutes. Divide the dough equally into 18 pieces of approximately 50 grams each and shape them into balls. Place the ball shaped dough into a greased and lined 9″ round baking pan. Let the dough do the final proofing in a closed oven (without power switched on) for about 40 minutes. Bake the proofed dough for approximately 20 to 25 minutes or until the tops were browned enough. Remove baking pan from oven when baked and transfer the rolls onto cooling rack to cool immediately. Glaze the rolls with melted butter while they are still hot. I had a few bites of my Old Fashion Pull Apart Butter Rolls after dinner and I was extremely pleased with the outcome of these rolls. They were soft and fluffy. And it even have the pull apart streaky texture! The butter taste was not strong in the soft bread but on the top after they were glazed. 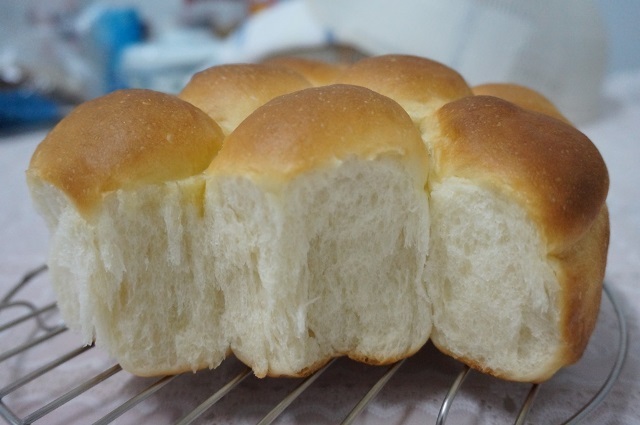 These rolls were definitely good to be eaten when warm but they were still good when cool. I left a few pieces of these rolls at home for my parents and bringing the remaining to workplace tomorrow to share with my colleagues.